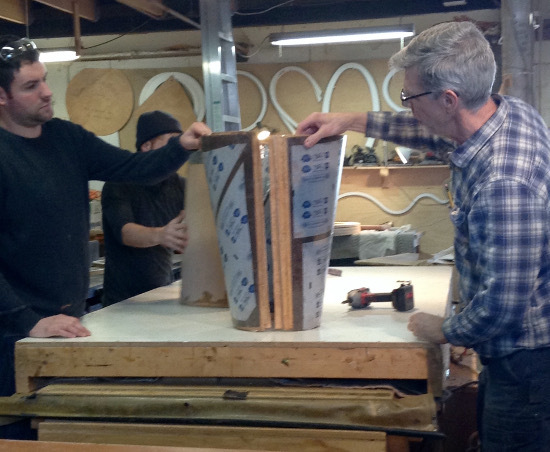 On a recent trip with the Artful Home staff, I was privileged to visit the studio of Richard Judd, a furniture designer inspired by Zen Buddhism. 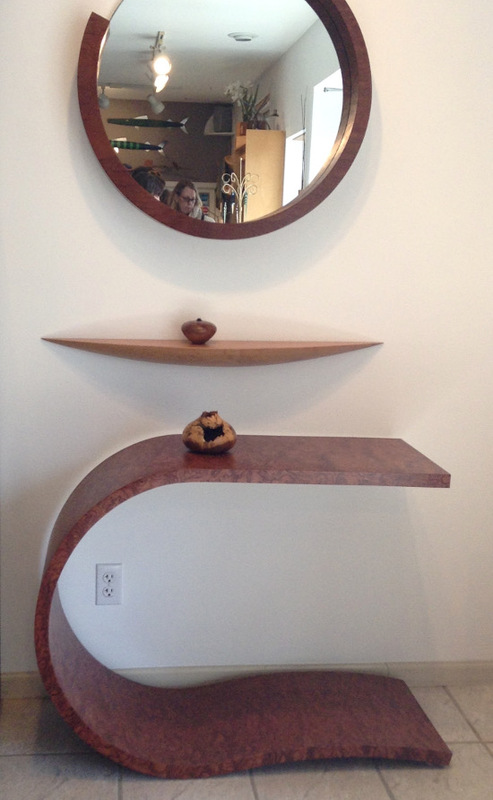 Richard Judd’s Enso Mirror, Long Arc Shelf, and Spring Table on display in his gallery. Using innovative techniques and tools like vacuum pumps and heated blankets, Judd reveals his engineering background in everything he does in the studio. He combines these modern techniques with the ancient principles of Buddhism, allowing him to design pieces that possess an effortless flow and meditative tranquility. The way he worked with each piece and moved through his studio illustrated to us how deeply ingrained these principles are in his everyday process. 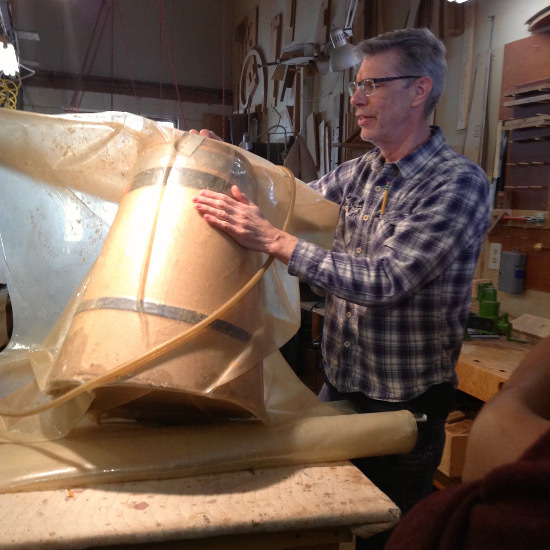 Richard Judd demonstrates the use of the vacuum-press technique while working on a Catalan End Table. Judd uses pliable wood boards to create his furniture. 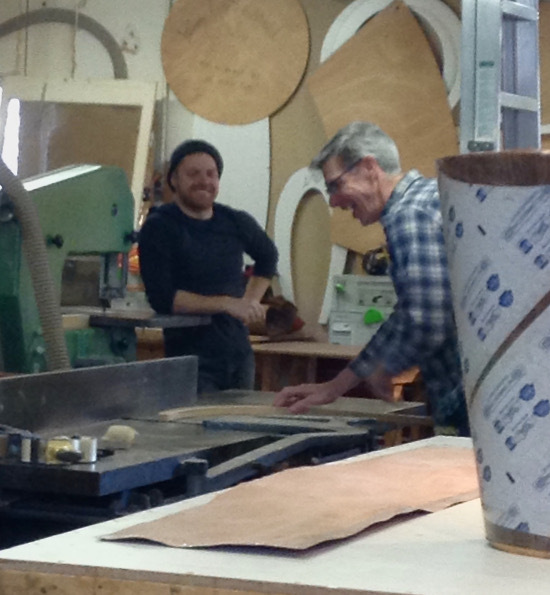 Judd and his two-person staff create every piece with a dedication to detail and a passion for excellence. Like a fine-tuned machine, the team members work together seamlessly, creating together with effortless precision and balanced roles. 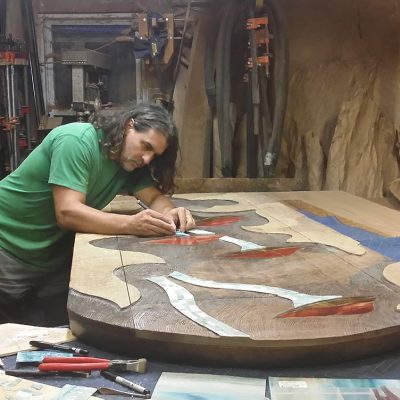 One person rolls the glue while the other lays out the pliable wooden boards, and then they come together to add the pressure, turning multiple working parts into a cohesive whole. Judd and his team work together in every step of the process. I was struck by Judd’s remarkable ingenuity in transforming a small workspace into a fully functional studio capable of supporting many projects at once. He utilizes tools of his own invention to create smooth textures and ensure the finest quality. His love for his craft bubbles into his commentary about his process, and it was clear to me throughout the tour that Judd places a great deal of his own personality and passion into his work. 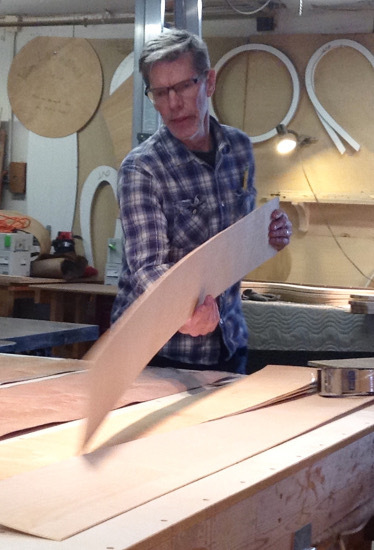 Judd works on the base of a Spiral Coffee Table. I was enamored with Judd’s friendly charm and welcoming attitude, and very thankful for the opportunity to visit such an incredible and innovative artist. I would feel honored to have a Richard Judd piece in my own home, and I left the studio full of admiration. This feeling was shared by everyone else on the trip, and the sense of joy was infectious. Smiles were found all around! An amazing artisan! Great skill with is displayed in manipulation of materials and fluidity of design. Great information. Lucky me I recently found your website by accxident (stumbleupon). I have biokmarked it for later!